Would you like to sell stuff you’ve made and quality pop culture items (comics, toys, records, etc) that are taking up space in your home? We are accepting applications for 6′ tables now. Space will be a bit more limited in the past so please let us know what you are selling. We will review your application and contact you for payment. Thanks! • 6’ tables are $25. We will contact you for payment once your application has been accepted. • We will provide tables, if you require a chair, please bring your own. • Set up starts at 9AM. Please plan to stay until at least 4PM but you are welcome to stay later if things are going well for you! • Heroes Pop Swap does not allow bootleg or counterfeit materials of any kind. • We are proud of our family-friendly reputation and strongly discourage adult materials of any kind. • We reserve the right to eject violators of our policies, without refund, at our discretion. Heroes Pop Swap is an idea that I had on the way back from a recent road trip. BeforeHeroes Convention and the Charlotte Mini-Con and even the Heroes store, local comics fans would gather and trade comics and talk about our hobby. It was usually something like a sidewalk sale put together by a local bookstore and/or newsstand. I remember going to similar events in Winston-Salem, Greensboro, Raleigh and the famous Murray Brothers’ backyard and basement gatherings in Durham during the latter half of the 70’s. None of us “old-timers” were official dealers yet. None of us had stores. We just shared a common interest in collecting as well as buying and selling comic books and related stuff. 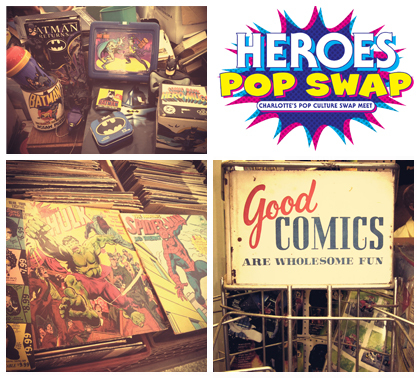 We thought we’d try to bring back that feeling from those events with theHeroes Pop Swap: Charlotte’s Pop Culture Swap Meet. For a nominal fee anyone can reserve space and sell items from their personal collection to other fans who are sure to give that item a good home. We are also encouraging local artists and artisans to come and sell their art, pop-culture related crafts and comics. ← DOLLAR COMICS THIS MONDAY!